Collapsible camo zipper up bottle insulator fits most bottles. Full Color Camo Coolies available in 6 Colors! Not so hard to find camo koozies! 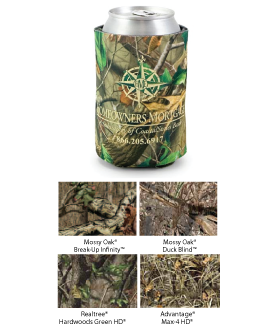 Our camo coolies are available in numerous licensed Mossy Oak patterns. These patterns are approved by "Mossy Oak" and are a perfect compliment to your event. We also offer free design help if you are not exactly sure what you are looking for. Many times our customers just give us an idea and then our designers get to work on a perfect design for your event. Maybe the Trademark Patterns are out of your budget? If so we offer a budget friendly camo coolie. Our Green camo and Tan camo coolies are available online for purcahse starting at $0.50/ea. To get started just click on one of the links at the top of the page. KooziesOnline.com offers a wide selection of can and bottle koozies. These are sleeves that help keep individual drinks at the proper temperature. 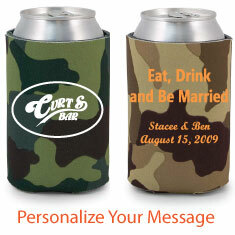 Each of our coolies can be personalized with the text or logo of your choice. Wedding guests love this kind of keepsake, and we offer hundreds of pieces of clipart to help with your design. Copyright © 2015 KooziesOnline.com. All Rights Reserved.